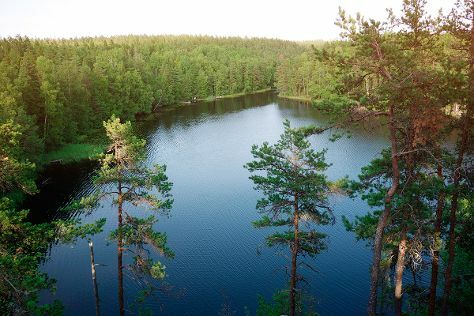 Step out of the city life by going to Nuuksio National Park and King's Road. Do some cultural sightseeing at Sea Fortress Suomenlinna and Helsinki Cathedral. Take a break from Helsinki with a short trip to Bellevue Beach in Hanko, about 1h 30 min away. Next up on the itinerary: contemplate in the serene atmosphere at Rock Church, tour the pleasant surroundings at The Esplanadi Park, wander the streets of Katajanokka, and indulge your thirst for a good beer at Stadin Panimo. For maps, other places to visit, more things to do, and tourist information, go to the Helsinki journey planner . If you are flying in from United Kingdom, the closest major airport is Helsinki Vantaa Airport. In December, plan for daily highs up to 3°C, and evening lows to -3°C. Wrap up your sightseeing on the 18th (Wed) early enough to travel back home.